South African workers prepare to host the BRICS Across the world, trade unions are under unprecedented threat, as just witnessed in the United States in the Janus vs. AFSCME Supreme Court decision which denudes an already weak labour movement of public sector power and funds. Where, then, does organisational hope for working people lie? The greatest potential for labour internationalism may one day exist within the largest combined proletariat: the Brazil-Russia-India-China- South Africa (BRICS) bloc. The BRICS state leaders meet in Johannesburg from July 25-27 and union officials gather in Durban the following weekend. Since 2012, the BRICS Trade Union Forum (BTUF) has brought labour leaders together, attempting to traverse extremely difficult terrain using an ever-changing roadmap. Unfortunately, it is becoming obvious that along this path, BTUF leaders suffer a well-known problem: signaling to the left while driving the vehicle towards the right, as the ground underneath the vehicle keeps shifting. For the BTUF to reach the desired location would require major adjustments in navigation, new passengers and very different maneuvers. South Africa’s BTUF affiliates are the Congress of SA Trade Unions (Cosatu), allied with the ruling African National Congress (ANC) since the 1980s, with 1.7 million members; the traditionally most conservative (and historically white) Federation of Democratic Unions of SA (Fedusa), with 700,000; and the National Council of Trade Unions (Nactu), which has radical pan-Africanist rhetoric but suffers substantial internal strife, with 260,000. Membership figures ebb and flow. Aside from Fedusa which won back a public sector union last year, all have lost support. After the traumatic 2012 Marikana Massacre of 34 Lonmin platinum mineworkers who were on a wildcat strike, Cosatu’s National Union of Mineworkers (Num) surrendered much of its membership (down from 300,000 to 187,000) to the Association of Mineworkers and Construction Union (250,000 workers). Even if divided and weakened, South Africa probably hosts the most advanced and coherent of the BRICS union federation affiliates, and certainly boasts the most militant proletariat. Yet due to internal rivalry following ideological and strategic divergences, the BTUF specifically excludes the SA Federation of Trade Unions (Saftu) and its 680,000 members. Saftu’s formation last year, after Cosatu’s leader Zwelinzima Vavi and the 350,000-strong National Union of Metalworkers of SA (Numsa) were expelled, followed by the Food and Allied Workers Union (with 130,000 members) and a few others. The reason was Saftu’s much stronger opposition to ANC neoliberalism and state corruption than Cosatu’s loyalist members, at the time led by Num. Saftu is excluded from the BTUF on spurious grounds: it has not been admitted to the National Economic Development and Labour Council (Nedlac), a corporatist institution which critics argue is a ‘toy telephone,’ often irrelevant. However, such threats aside, Cosatu remains committed to building Nedlac and as a result, the boycott of Saftu – especially of its leader Vavi and Saftu’s metalworkers affiliate (South Africa’s largest union by far) led by Irvin Jim – shifts the BTUF ideological orientation much more to the centre. As a result, the BTUF is likely to maintain its status quo approach, no matter how dangerous this is for members, societies and the environment. That route forward is merely continuation of predictable annual meetings in which trade unionists endorse the business-as-usual BRICS agenda, even while huge changes are underway in geopolitics, economics and environment – nearly all of which undermine labour, the broader society and the natural environment. A different route would be to confront these contradictions head on, and to pursue greater shopfloor and grassroots unity. On July 21-22, the weekend before the BTUF meeting and just before the BRICS leaders’ summit, Saftu will gather thousands of its members plus civil society allies for a Workers’ Summit, which will more clearly spell out major policy and political differences with the other federations. For example, in April, Saftu put tens of thousands of workers on the streets against a proposed minimum wage – one strongly supported by the other three federations but which ranges between just $0.80-$1.50/hour, i.e., ‘paltry’ according to Vavi. (The realistic poverty line is $110/person/month.) However, there are occasionally signs of potential unity amongst left-leaning trade unions. Such shopfloor resistance was witnessed when in mid-June, tens of thousands of Num mineworkers and Numsa metalworkers at the parastatal electricity supplier Eskom engaged in wildcat protests – allegedly using intimidation and ‘sabotage’ – sufficient to create a rolling national blackout. The unions’ objective was to discredit Eskom’s 0% wage offer (the inflation rate is 4.5%), and they immediately succeeded in gaining a new offer above 6.5%. South Africa’s capitalist class was visibly unnerved by this show of strength, a precedent that might even lead to formal institutional Num-Numsa reconciliation, as Num’s more critical leaders won greatly increased power at their recent electoral convention. This is also apparent on home turf, for in some BRICS countries, the labour movement is extremely weak, e.g. China, which is characterised by state control, lack of autonomy, migrant labour discrimination, low wages and wildcat strikes (often harshly repressed). Conditions are worsening due to new technologies and to fewer freedoms to organise. One result is a relatively low level of absolute wages in the BRICS, illustrated within a sectoral case study: the textile industry. In 2011, South African textile workers were paid €3.8/hour, compared to €2.8 in Brazil, €0.8 in coastal China, €0.7 in India and €0.5 in inland China (the average wage in rich countries was €16.8/hour, but lower still are prevailing wages in places with vast labour reserves such as Vietnam and Bangladesh, at €0.3/hour). In other words, within a complex world division of labour characterised by global supply chains, the power of corporations controlling upstream value-chain components means that both BRICS and hinterland economies continue to suffer from super-exploitative processes: a wage rate that is often lower than the cost of reproducing labour-power. As an example, South Africa’s Bantustan system was typical of the migrant labour relations that left caring for children, sick workers and the retired as a task for women in far-off settings, with little or no state support. This form of internal migrancy has usually emerged because it is extremely profitable, insofar as the employer does not bear the full cost of social reproduction. Such a system characterises labour on the east coast of China, as well as sites like Marikana where mineworkers killed in 2012 were all migrants. As a result of low wages paid to the majority of BRICS workers, labour’s input into GDP is relatively low. In most of the five (except South Africa), the recent period (2011-15) has witnessed a deterioration of the contribution of labour to GDP, according to UN DESA. Fixed capital investments that would raise labour productivity have been weak. Instead of incoming Foreign Direct Investment taking advantage of wage differentials, recent years witnessed much less capital-deepening investment. One additional factor in labour productivity is worker militancy. One way to measure business-labour relations is the World Economic Forum (WEF) annual listing – based on polling 14,000 business executives from 137 economies – of shopfloor collaboration on a spectrum from most ‘confrontational’ to most ‘cooperative.’ In the 2017-18 Global Competitiveness Report, three of the BRICS – South Africa, Brazil and Russia – rated amongst the most confrontational third of the world’s national workforces. Indeed, South Africa has ranked as having the world’s most militant proletariat since 2012, the year of the Marikana Massacre. The other two BRICS, India and China, are measured as having amongst the world’s more cooperative half of national workforces. Of course, the supposed average-level ‘cooperation’ in the two largest BRICS may disguise intense pockets of labour militancy: in China there are several thousand illegal wildcat strikes per year, and in India in September 2016 there was a national strike of an estimated 180 million workers, the largest in world history. There is extreme variability in these BRICS labour experiences, resulting in unevenness and diversity of trade unions and federations. Still, universal trends are bringing BRICS workers into closer alignment, especially worsening casualisation and the 4th Industrial Revolution’s technological displacement of workers, as well as growing surveillance and privacy threats. The 4th Industrial Revolution – conjoining latest advances cybertech, robotics, Artificial Intelligence (AI), nanotechnology, biotechnology, etc – is a major theme in the 2018 BRICS summit. Naturally, official rhetoric has downplayed the likelihood of vast service sector unemployment, intensified social engineering and e-totalitarianism such as China’s ‘social credit,’ or technological disasters of the sort anticipated when AI and robotisation are combined. In their official BTUF statements, the trade unions asked leaders to assist in the “de-monopolisation of the world market of software and IT-equipment, internet infrastructure management” (2016). This was based upon a valid critique of tech-corporate power, and was especially appropriate in India from where the resolution emanated. In 2017, however, “We appeal to the BRICS governments to seize the opportunities brought by the new round of industrial revolution and the digital economy” – yet the BTUF failed to identify the many associated dangers. Against these trends, resistance to surveillance, robotisation and casualisation is not impossible. In South Africa there was an outcry by Cosatu’s banking union the South African Society of Bank Officials in 2018 against a major bank (Nedbank) for its planned replacement of 3000 workers with 260 robots. However, the South African labour movement’s consistent demands to ban outsourcing in all sectors have been rejected by the ANC. The more militant unions, including not just Saftu but also some in Cosatu, lost campaigns against the introduction a sub-minimum youth wage in 2015, and against new labour legislation which includes a weakening of unions’ ability to call strikes. The most important legal cornerstone of the 4th Industrial Revolution is corporate intellectual property, and destruction of these commercial rights applied to essential medicines was also the objective of South African workers during the early 2000s, in the case of Big Pharma’s monopoly control of AIDS drugs. Just as stigmatisation of HIV+ South Africans was peaking, Vavi and Cosatu trade unionists formed a courageous alliance with the Treatment Action Campaign (TAC), demanding free medicines for more than five million affected people. Although this campaign fatally soured relationships with then-president Thabo Mbeki, who was an AIDS denialist, international allies joined TAC and Cosatu to win a Trade Related Intellectual Property System exemption in 2001. As the medicines then became free by virtue of generic companies’ provision, via South African state health clinics, life expectancy rose from 52 in 2004 to 64 over the subsequent dozen years. And in a battle against President Jacob Zuma lasting through most of the 2010s, Cosatu (along with the Opposition to Urban Tolling Alliance) undermined state surveillance capacity and Public Private Partnerships – both also crucial to the 4th Industrial Revolution – with successful activism against e-tolling on Johannesburg-area highways. In campaigns that have not yet been won, trade unions have also worked closely with the Right2Know movement, demanding free data and airtime so as to achieve the right to communicate, and opposing surveillance and Big Data social control. R2K welcomed Cosatu’s crucial support against Zuma, to continually derail the so-called secrecy bill (“Protection of State Information” bill) which would have hampered whistle-blowing. All of this represents a 4th Industrial Counter-Revolution, in which potentially vital technology (e.g. AIDS medicines) is appropriated as part of the world commons, and destructive Big Data and surveillance techniques are regulated or prohibited, bottom up. These are some of the most encouraging signs of counter-power. But within the BRICS, when it comes to discussions about the dangers of outsourcing and 4th Industrial Revolution, such signals are muffled to the point of silence. Indeed, when trying to promote workers interests here and in nearly all other crucial socio-economic battles, the record of BTUF advocacy by national trade union leadership in the BRICS countries reveals many more disappointments than successes. Part Two considers the ways the BTUF’s ‘social dialogue’ advocacy strategies within the BRICS can, sadly, be characterised not as watchdog, but as lapdog. In contrast to the militancy now rising in Brazil-Russia-India-China- South Africa (BRICS), the BRICS Trade Union Forum (BTUF) annual efforts at influencing the bloc are mostly aimed at social dialogue: promoting state-capital-labour tripartism in areas of common concern with BRICS leaders and the BRICS Business Council. But whether in Russia (2012), South Africa (2013), Brazil (2014), Russia (2015), India (2016) or China (2017), these efforts have not been successful. This is likely to continue, if labour links to civil and uncivil society continue to be ignored, and if workers are not brought into the process. Privileged leadership seems to prefer closed-door sessions, and does not bring the BTUF to its membership’s attention, much less bring workers’ concrete demands and struggles to the BRICS elites’ attention. Over six years, the BTUF has made reform proposals in the fields of global trade, finance, investment, climate and geopolitics, all areas in which workers and the rest of the world had hoped BRICS leaders might provide a genuine alternative to Western imperialism. Instead, the BRICS amplify neoliberal and anti-Southern multilateral perspectives, as argued elsewhere. But that opportunity was lost within six months, when multilateral deform – i.e., strategies adopted by world elites against the interests of workers – occurred in world finance, trade and climate summits in Washington, Nairobi and Paris, and will probably not arise again. Indeed it is ever more likely with the role of Donald Trump, with economic conditions rapidly worsening, and with growing official hostility to trade unions in especially Brazil, India and South Africa, that the interests of big business will prevail even more in the years immediately ahead. With non-existent BRICS reforms, the IMF retains its structural adjustment orientation and the BRICS representatives voted to confirm Christine Lagarde as its managing director in 2015 and even in December 2016 the day that she was convicted of negligence in a Paris corruption trial for a $430 million tax avoidance gift to a French Conservative Party contributor. In Nairobi at the 2015 World Trade Organisation summit, the BRICS were split when Brazil and India defected from long-standing positions in favour of food sovereignty, joining the negotiators from Washington and Brussels against the interests of the masses. And at the United Nations Framework Convention on Climate Change in 2015, the BRICS also endorsed the U.S. and European Union standpoints, rendering useless the Paris Climate Agreement: no binding agreement; inadequate emissions cuts; no climate debt; a return to carbon trading; no concern for military, air and shipping emissions. Hence the main question today, especially after right-wing, anti-worker forces have ascended to power in so many countries, is whether the BRICS role in ‘new global management’ is any different than the old – and whether trade unionists have any influence, and hence an interest in legitimating the BRICS as a bloc. To explore that question, consider the BTUF’s 2012-17 statements about its agenda, grouped into the categories of institutional development; participation and vision. (Elsewhere, in the book BRICS Politricks, we consider more content-oriented topics: trade reform and regulation of transnational corporate investment; multilateral financial reform and innovation; climate change and environmental protection; and geopolitics). In each case below, the most explicit advocacy statements are provided (in quotation marks with date of statement in parenthesis) followed by a preliminary assessment of results. The BTUF in 2012 “declared the setting-up of a BRICS Trade Union Forum” and has followed through each year with a meeting, discussions and a declaration. “Our representation in the BRICS Trade Union Forum will be broad, pluralistic, democratic and inclusive of working men and women of our nations” (2014). “We also aim at identifying common programs and activities that build on each other’s strengths and virtues, with research and policy cooperation as a key element of that effort” (2014). Though representivity is obviously in dispute given the conflicts especially involving BTUF member federations from China, India and South Africa (in relation to other workers not members of those federations), the objective of establishing the BTUF has been largely achieved. However, the BTUF could obviously be much better empowered for participation in BRICS summits, could generate alliances with other actors, could bring masses of workers into the process, and could establish the basis for genuine solidarity (e.g. 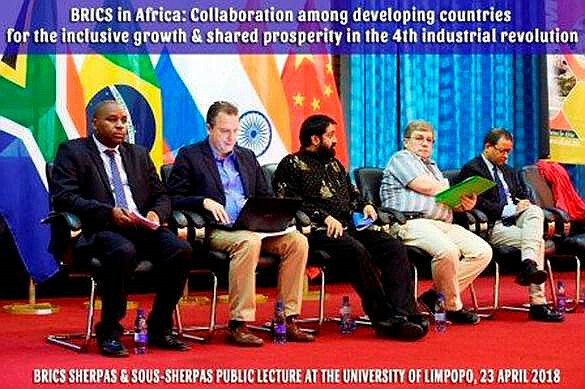 when workers and citizens fight the same BRICS firms), in order to avoid the perception of a talk-shop. The need for research and policy coordination appears to have only begun; given that with perhaps one exception (Rio-based Instituto Brasileiro de Analises Sociais e Economicas), BRICS think tanks are hostile to organised labour’s interests. The BTUF has made a consistent request to the BRICS leaders to “include the issue of Social Dialogue and of cooperation with Trade Unions” (2012), including through “national and global tripartite dialogue structures” (2013). The BRICS leaders should recognise the BTUF “as an institutional space within the BRICS official structure. We express therefore our expectation to have the same treatment as the Business Council, having our conference as part of the official program” and “be represented in the various task teams” (2014). “The model of interaction in the social triangle trade unions/business community/government structure has long proved its effectiveness at the national level in each BRICS country, and must find its logical extension into BRICS institutions” (2015). “We consider formal recognition of BRICS Trade Union Forum on an equal basis with BRICS Business Council as one of our priority objectives” (2016). “We appeal to the BRICS countries to improve the BRICS cooperation mechanism, grant the BRICS Trade Union Forum a status on par with the BRICS Business Council…” (2017). These annual attempts at reaching formal tripartite status have been rejected, although there are efforts by BRICS Labour and Employment Ministers to at least briefly discuss matters of participation with the BTUF, and a BRICS Working Group on Employment has been established. The problem lies not only in BRICS mechanisms, but in each country. For example, most Indian trade unions boycotted 2016 BTUF proceedings on grounds of differences with the Modi government, just a few weeks after the historic September strike which witnessed 180 million labourers refusing to work. The BTUF consistently fails to tap into such militancy on the ground, preferring polite ‘policy asks’ to any sign of protest at BRICS’ leadership events. The BRICS countries with the strongest social dialogue structures and collaboration between ruling party and trade unions are Brazil and South Africa. The tough Brazilian trade union critique of Temer’s government – as a corruption-riddled constitutional coup regime – reflects breakdowns in the former tripartite arrangements, especially after the jailing of Lula on an apparent corruption frame-up in 2018. South Africa’s Nedlac has not functioned well in recent years, as noted above. Further, the BTUF requested that “BRICS trade unions should be represented on the BRICS bank’s highest decision-making body” (2013). This request was ignored in the Fortaleza construction of the BRICS NDB, which resulted in a small (10-person) management and directorship – all male – without any high-profile voices that represent the interests of poor and working-class people, or the environment. One result, in South Africa, is that the first two BRICS NDB loan offers promote privatised electricity supply through the corrupt Eskom parastatal agency, and port expansion through the corrupt Transnet parastatal. The BTUF is silent on such malgovernance of finance, even though $2 billion has been contributed to the NDB from the fiscus in each of the BRICS member countries. The BTUF vision statements repeatedly stress the need to promote labour’s interests, albeit within the capitalist system. The most recent, from the China meetings in 2017, are illustrative: “Foster the concept of a community of shared future for mankind and deliver robust, sustainable, balanced and inclusive growth in the global economy” (2017); and “improve their labour policies, increase jobs, encourage innovation and entrepreneurship, raise financial input for vocational education and job training, establish an inclusive and efficient job training system, deepen cooperation with social partners, intensify efforts to provide employment and re-employment training for workers and enhance workers’ competency and adaptability” (2017). The BRICS Trade Union Forum vision statements are all appropriate as minimal common desires for labour, but they lack the sense of a proper workers’ manifesto. The traditional goals of the working-class movement – socialisation of production and decommodification of the reproduction of labour power – are not mentioned much less elaborated. BTUF statements never draw explicitly on the constitutions and policy documents of the member federations, several of which are explicitly socialist. One such labour manifesto stands out, the earliest one, from the International Working Men’s Association: The Communist Manifesto. Such traditions of labour solidarity are vital for turning working-class values into practical cross-border collaboration. But it would be a quite extraordinary leap of ideological maturity for the BTUF to mention this tradition, one still too far to contemplate. The big question remains whether these values can be implemented by BRICS governments which are in all cases – rhetoric aside – quite explicitly hostile to the BTUF agenda. Several examples of this dilemma can be considered, such as trade and corporate investment, multilateral finance, climate change and geopolitics. In each case, as discussed elsewhere, the BTUF has returned empty handed, year after year. Further politicisation is evidently necessary. Indeed, the potential for fighting back – for class struggle instead of class snuggle – is enormous. The alternative approach to BRICS labour politics – based not on social dialogue but social power – entails, first, identifying as many other oppressed allies as possible (not simply gazing upwards in search of tripartite relationships which have proven so disappointing thus far). Making alliances with these social forces would expand the BTUF field of vision to more explicitly incorporate the interests of poor and working people, women, students and youth, environmentalists, the LGBTI community, and social movements across so many other issue areas. 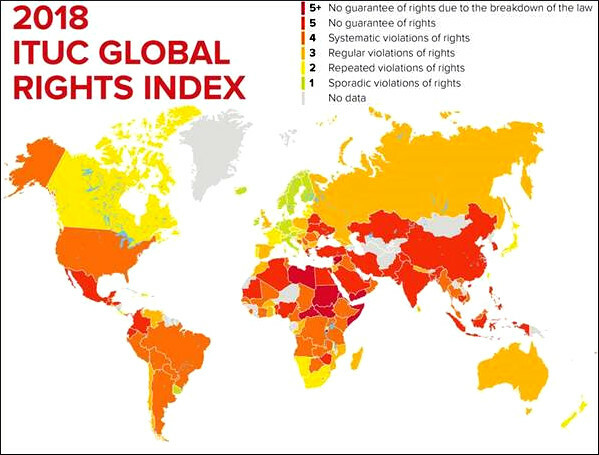 The best example of brics-from-below dates back more than 15 years: the economic attack against Western pharmaceutical corporate patents by two governments – Brazil and India – subsequently aided by South African HIV+ activists in the TAC, Cosatu and their allies. By opening a state-supported generic industry and ignoring international property rights, the Indians and Brazilians assisted progressive South Africans who overthrew the denialist AIDS policy adopted by former president Thabo Mbeki. The combination of decommodification and deglobalisation of capital, and the coalition between progressive governments and radical community activists was decisive, with an extraordinary result: a rise in life expectancy from 52 to 64 in South Africa alone. Can that same alignment be repeated, and can it serve as the basis for an entirely different approach to BRICS, fusing states and people in the public interest? Regrettably, the BRICS have chosen the course of undergirding – not undermining – imperialist multilateral agencies (the Bretton Woods Institutions, WTO and UN climate process) whose role in commodifying all aspects of life and globalising capital is disastrous for poor and working people, within the BRICS as well as for Africa. What that means for BRICS in the years ahead, it is fair to predict, is more top-down scrambling within Africa, and more bottom-up resistance. Where African governments emerge that have more patriotic instincts, there will be scope for campaigning on matters of economic justice: e.g. against mining and petroleum extraction, illicit (and licit) financial flows, and illegitimate debt. With the profits of so many Western firms in Africa hitting new lows and their share value nearly wiped out (e.g. the 2011-15 cases of Lonmin, Anglo, BHP Billiton and Glencore, which each lost more than 85% of value), there are precedents for what BRICS firms now may find logical: yet more extreme metabolisms of extraction and more desperation gambits to keep BRICS-friendly regimes in power, at the expense of the reproductive needs of society and nature. But resistance is already evident. For example, the BRICS People’s Forum counter-summit in Goa in October 2016 had strong labour inputs, as did the next year’s event, in September 2017 in Hong Kong. In Johannesburg, a brics-from-below Teach-In will occur in Johannesburg on 23-24 July followed by a protest march – ‘Break the BRICS’ – to the BRICS summit itself will be sponsored by the United-Front Johannesburg network, which was itself the product of the metalworkers’ break from Cosatu (http://bricsfrombelow.org). Further alliances of a horizontal nature are also obvious, not only with civil society – especially trade unions – and not only reaching out far into Africa where BRICS has had a destructive or constructive impact, but also with other trade unions across the world. Also in the 2018 host city, Johannesburg, the week before the BRICS elites’ summit, the 800,000-member SA Federation of Trade Union – an explicitly socialist and anti-ANC network led by the metalworkers union (SA’s largest) – has called for a July 21-22 Workers’ Summit, at which the main grievances of the BRICS working class will again be aired – and the inability of the elites to solve these problems will again be obvious.